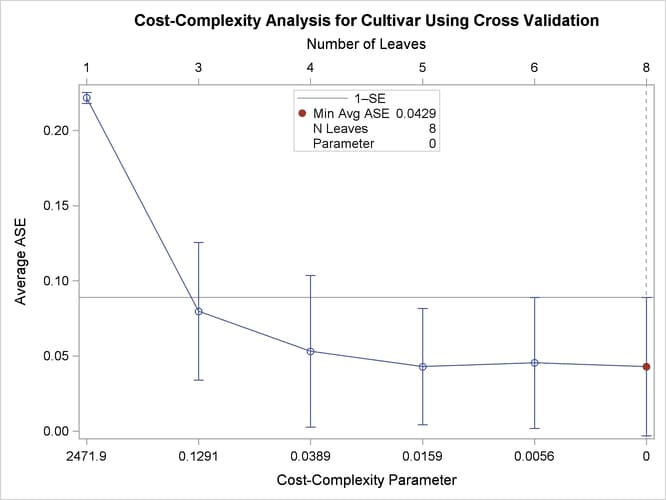 This example shows how to construct this plot by using the misclassification rate in place of the ASE and by using Breiman’s 1-SE rule to select the pruning parameter. Alkan    = "Alkalinity of Ash"
ODRatio  = "OD280/OD315 of Diluted Wines"
The CVCC option displays a table of cost-complexity pruning based on cross validation. This table contains cross validated estimates of the misclassification rates and ASEs and their standard errors for each value of the pruning parameter. 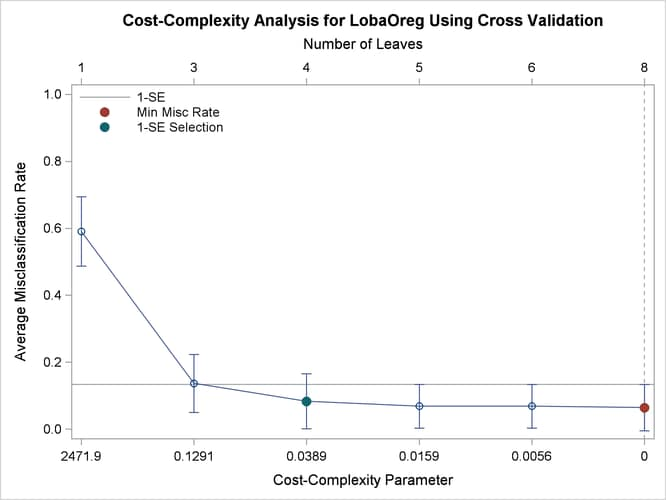 An ODS SELECT statement selects only the cost-complexity pruning table and plot. An ODS OUTPUT statement outputs the cost-complexity pruning table to a SAS data set. Output 61.6.1 displays the table that you requested by using the CVCC option. Output 61.6.2 shows the default plot, which displays the ASE on the vertical axis. Output 61.6.3 displays the results. The results of this step are not displayed.